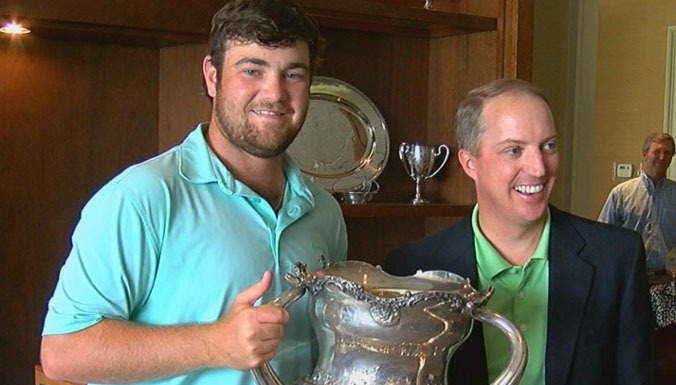 Alabama golfer and Riverside High School grad Jonathan Hardee won the nationally recognized Southeastern Amateur championship at the Country Club of Columbus. Hardee, a rising senior, finished the tournament at 18-under par. He shot a 262 total and earned a victory over Georgia Tech golfer James Clark. “Winning this event means a lot to me,” Hardee said. “It’s huge for me to start the summer this way. This was the first time I played in this event and the first time I’ve won an amateur, so it super exciting and feels really good,” he said. Hardee, playing in his first Southeastern Amateur, started the final round two shots off the lead. His final round 65 gave him a four shot victory. “For me to go out and win when it was the first time playing the course does a lot for my confidence and my career,” he said. Hardee finished in 19th place at the NCAA championship playing for the Crimson Tide last month. “It was great to continue the momentum I had from the NCAA Championships. Playing four rounds at the NCAAs helped me in this tournament because we don’t play a lot of four-round events in amateur golf,” said the Alabama senior. This was the 88th Southeastern Amateur. Hardee received the Jordan-Martin trophy for his victory.